What are herbs and why might my chickens need them? An herb or herbaceous plant is generally defined as “any plant with leaves, seeds, or flowers used for flavoring, food, medicine, or perfume.” Herbs can be used to prevent both internal and external parasites (via ingestion or externally when a chicken rubs against/brushes when walking by or sits upon them). Other benefits are brighter yolks, more nutritious eggs, more available vitamins and minerals for the birds in general, a calm flock and a lovely coop (among others things). How and where do I use herbs with my chickens? You can grow herbs as a part of your regular garden, medicinal garden, culinary garden or in and around the coop. Just snip or grab handfuls on the way to visit your birds. Or, grow herbs in hanging baskets – they’ll decorate and beautify the area and keep plants out of beak-reach until you’re ready to use them. If you plan to use plants inside the coop, you can clip or tie them in bundles and hang them on the outside of the nest boxes, from the ceiling or from nearby walls. RIR, Gingersnap, with fresh peppermint and roses in her nestbox. If using herbs inside the nest boxes, consider chopping them into bite-sized pieces for easier ingestion should a hen decide it’s a food or medicine she needs. 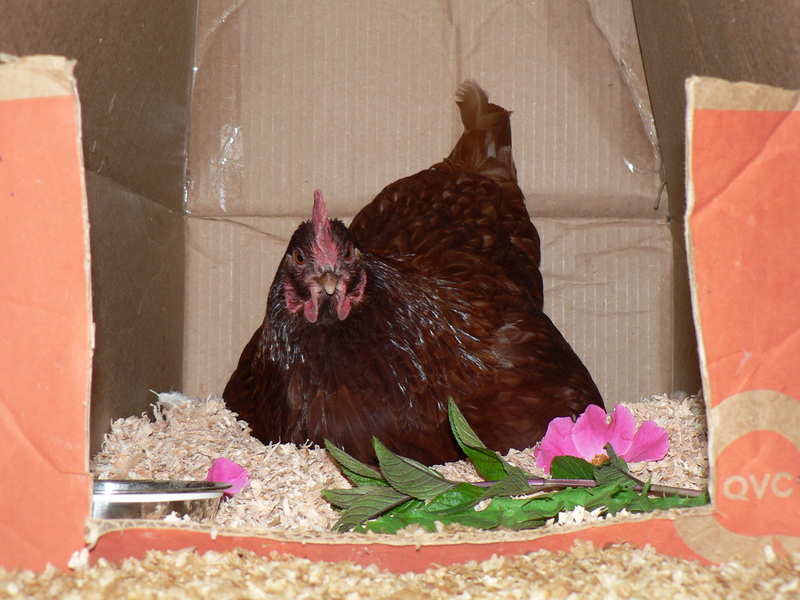 My Dominique hen, Sophia, chooses the box with dandelion greens and rose petals so she can snack while nesting. I use different herbs in different boxes (always leaving one empty) so that the hens have a choice. Someone asked me recently about a chicken’s sense of smell and I suggested, based on prior research, that many birds have a poor sense of smell, that this was probably true for chickens as well. As it turns out, the chicken genome was mapped in 2004 and these amazing birds were discovered to have more smell receptors than was previously thought, putting them on par with humans. All the more reason to offer your hens a choice! Plants offering external protection from parasites (for example: mugwort, rosemary, peppermint and lavender) can be grown near commonly used pathways and ramps so the birds plumage will brush against the foliage as they forage and move about. You’ll most likely find that your chickens will not eat aromatic herbs so they’re usually ok to plant within reach though there are sure to be exceptions. 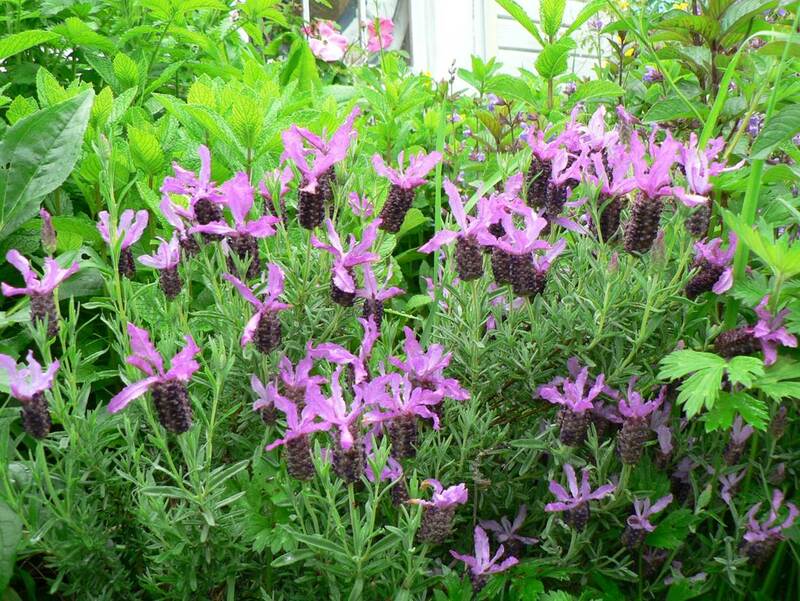 Lavender is an excellent multi-purpose herb that is safe for your hens. Tasty herbs should be planted with care so they can be purposefully harvested (by you) and utilized rather than devoured down to tiny stumps and the roots scratched to oblivion before their time (some examples: chickweed, comfrey and stinging nettle). 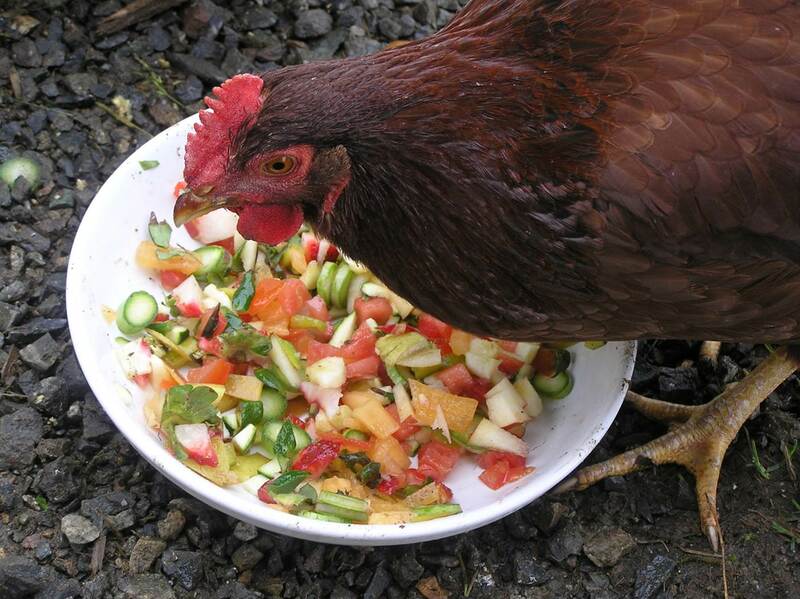 Just like people, chickens have a variety of foods they love and some things they just won’t touch. Remember that you can use dried herbs, too. They come in really handy when it’s cold and wet out. It’ll take some research and experimentation to find what works for you and your flock. Additionally, consider your goals. Are you looking to prevent mites or do you want an overall tonic for good health? Is your yolk color already fabulous but you want to make sure the eggs are as nutrient-packed as possible? Do you have stressed hens because of coyotes yipping near the coop after dark (chamomile and catnip work well, just like they do with people)? Choose plants that will grow well in your soil and in your plant hardiness zone (set yourself up for success). 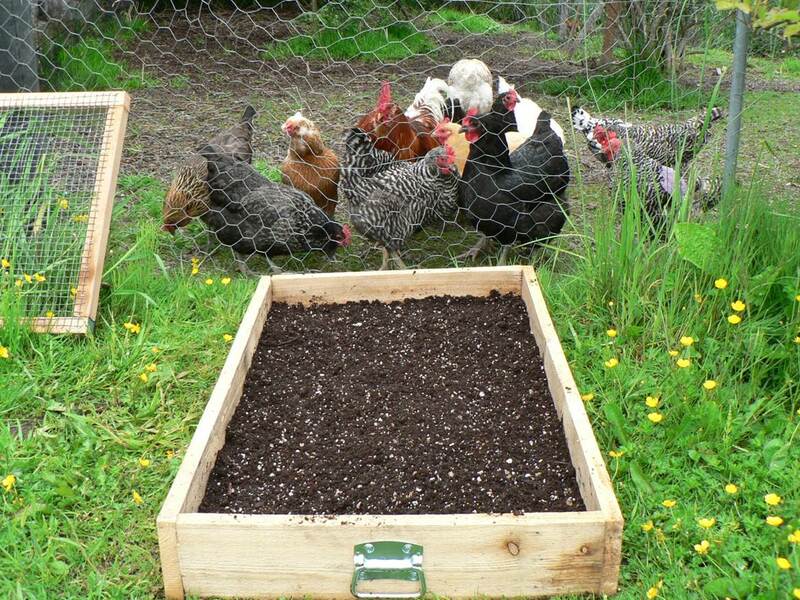 There are several informative blog posts that you’ll find helpful such as Fresh Eggs Daily’s posts: Nesting Box Herbs – Chicken Aromatherapy or Health Benefits of Herbs or Top Ten Edible Flowers Your Chickens Will Love. Another great article can be found at backyardpoultrymag.com. 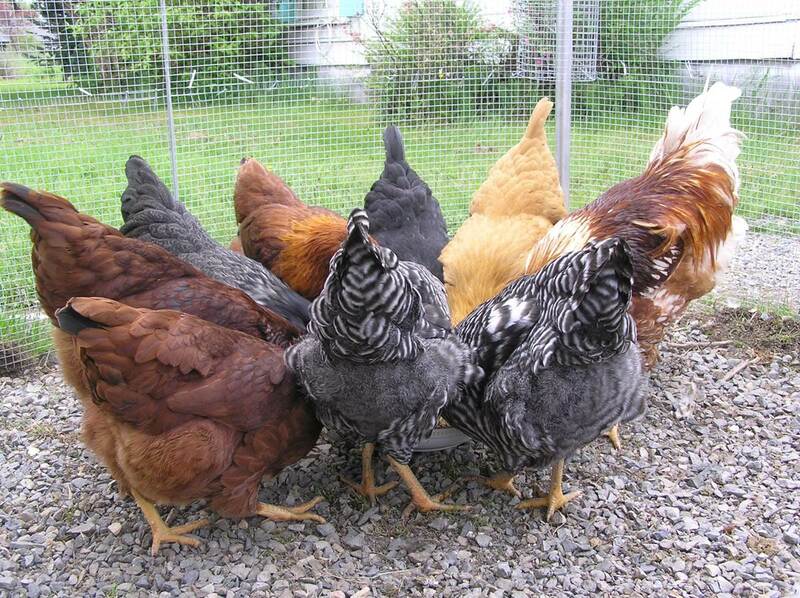 And, the Backyardchickens.com community is a fount of information on any and all chicken topics. I also skim through various parrot websites to research the herbs I’m considering using. Most chicken owners believe that their birds choose well and will not eat plants that are harmful even if they’re readily available, whereas parrot owners wish to avoid potentially harmful plants altogether. I find that parrot site lists of dangerous plants are very inclusive and really give me a feel for things to be aware of. And, always remember that while the internet is an amazing resource full of useful and helpful information, not all of the “truths” you find will actually be “facts”. So, take it with a grain of salt and remember that what works well for someone else may not be best for you and your flock. Slugs, bugs and earthworms may offer good, inexpensive protein, but aren’t they dangerous for my flock? The short answer is yes and no. If you research parasites (such as gapeworm), you will find people in varying states of panic commenting about their chickens having eaten worms and wondering if they’ll be ok . My understanding is that the parasitic life cycle goes bird->bird poo->earthworm/slug->bird. So, if you’re feeding worms out of your chicken manure compost pile then it seems a bit more risky. If you toss in some worms when tilling your garden, it’s probably less risky. My birds eat plenty of worms and slugs as they forage around the yard. I often throw in extras and have yet to have a problem but it’s still a risk to be weighed. If you decide you’d like to supplement their food with extra worms, I’ve found that one of the best ways to attract them (and beetles, potato bugs, slugs, etc.) is to lay down a large sheet of cardboard and keep it moist. The girls go crazy when I lift it up for them to discover the critters beneath. Large dirt clods (large enough that they can survive a few weeks of scratching) work well, too. In fact, that’s were I often find plump crane fly larvae, a hen favorite. So, a combination of research-research-research, careful monitoring and trusting my chickens to some degree to eat what’s good and avoid what’s bad (obviously don’t purposely leave something like poison hemlock growing in your yard and hope they choose well) is what works for me. You have to decide what works best for you (doing nothing is also a choice) because you know your flock better than anyone else. But I strongly believe we each have a responsibility to do our best for those in our care. Will mealworms work for me and my flock? This, and a slice of apple, is how you start your mealworm farm. The other reason I started my farm is for supplemental food. My chickens are pastured but occasionally due to weather or during rare times of confinement, they are unable to forage freely. Mealworms are an easy way to keep the insect nutrients coming their way. I believe that a variety of food options is best to keep my flock healthy, happy and continuing to produce the nutrient-rich and brightly colored eggs that I feed my family, friends and neighbors. Just like meat from a grass-eating cow gives you different nutrition than eating grass straight up would give, meat from the mealworm gives different nutrition to the chickens than if I fed them wheat bran straight up. There are so many websites that have extensive details and information, but I’d like to clarify a few things about mealworms. No, they aren’t stinky or gross (the “farm” smells slightly sweet and like the medium they’re kept in – I use Bob’s Red Mill wheat bran). No, they don’t escape (the beetles don’t fly) unless you give them something to crawl out on. If they do escape due to farmer error, they don’t survive for long (no worries about infestations). And, if you raise them yourself and know what food went into them, you can use them as food for yourself, too, if you’re into bugs a.k.a. entomophagy (saute and dip in melted chocolate – tastes like a Nestle crunch bar)! 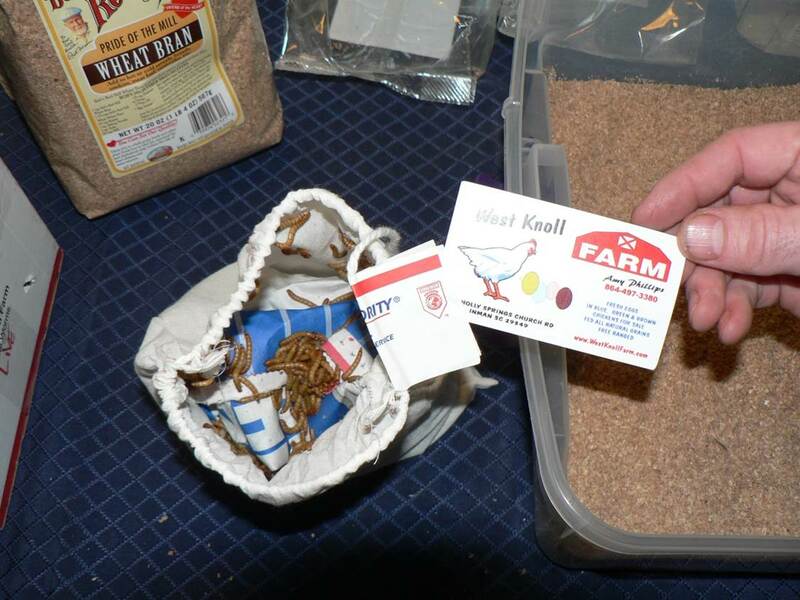 I purchased mine from Amy at West Knoll Farm in South Carolina – check out her detailed mealworm page. Another really informative site can be found here. What do I do if my chickens are confined and have destroyed every scrap of green in their yard? Eggs Daily’s blog DIY Chicken Salad Bar. You can also check out this YouTube video by Home Farm Ideas. I made mine from scrap wood and leftover 1/2 inch hardware cloth. You can grow all sorts of grains in yours but I really like Scratch & Peck‘s 3-Grain Scratch. It grows quickly, it’s organic and I want to support companies that are local (Bellingham) and Non-GMO! You can also consider sprouting your own grains separately. Sprouting seeds makes nutrients more available and it’s very simple to do. A Life Unprocessed has an excellent blog about Sprouted Grains for Chickens with detailed descriptions and pictures. To Sing With Goats has a fantastic fodder tutorial. With sprouted grains, you feed the grains or seeds much sooner – just after you see a little root sprout out. And with fodder, you’re waiting until the seed sends the leaves up as well. Be mindful of the possibility of compacted crop if the greens get to be too long. You might notice Ruby, my Barred Rock hen in the salad bar photo, (on the right side of the group) is wearing a lavender saddle or apron. I have 19 hens and a rooster. Mr. Sunshine has his favorites and Ruby is one of them. In order to protect her back, she wears a saddle with wing guards. It works very well and after the first hour or so of wearing it, the hens don’t seem to notice anymore. For those who are interested, my saddle source is Tess with Chicken Saddles and Diapers. She’s talented, creative and quick. So for those in the market for a little hen protection, please visit her site. 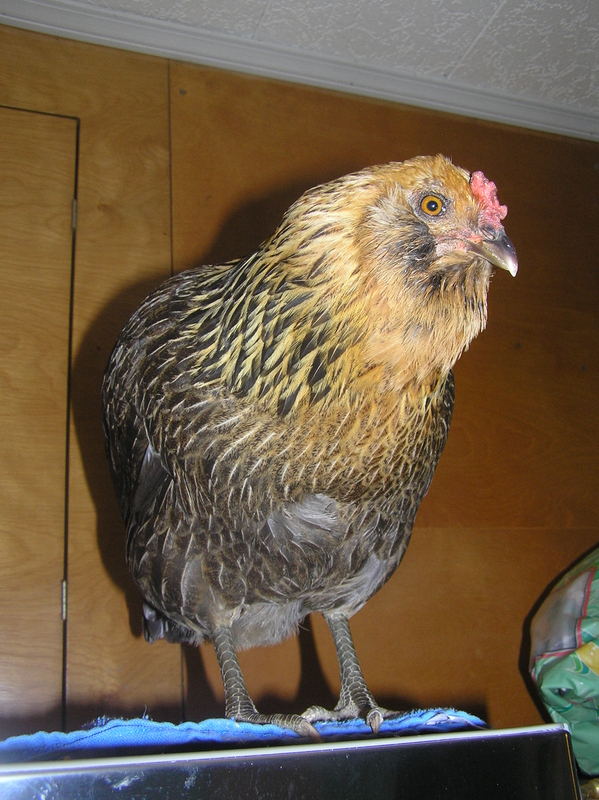 Ameraucana, Junebug, is as sassy as ever thanks to the chicken life-saving skills of Dr. Bruce Singbeil. 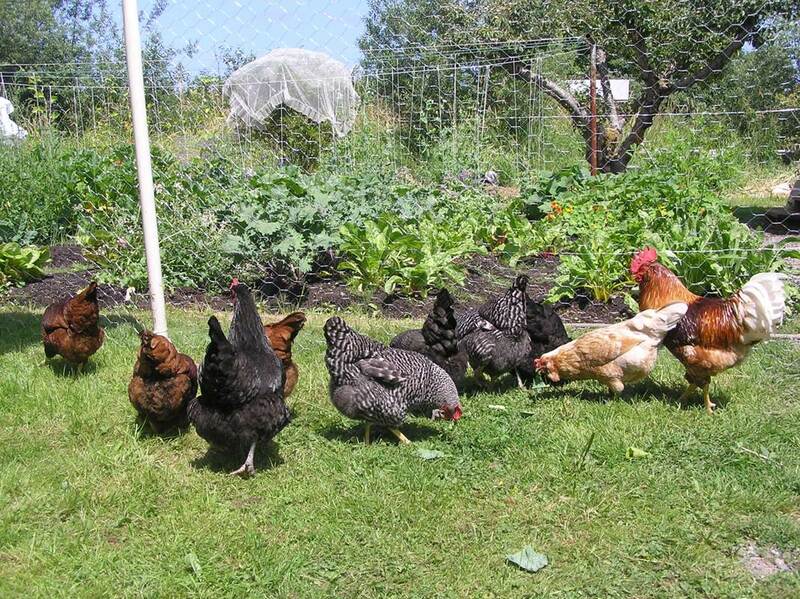 The WSU Avian Health and Food Safety Laboratory in Puyallup will perform inexpensive necropsies on deceased chickens (if you’re in Washington State, the fee is more if out-of-state). 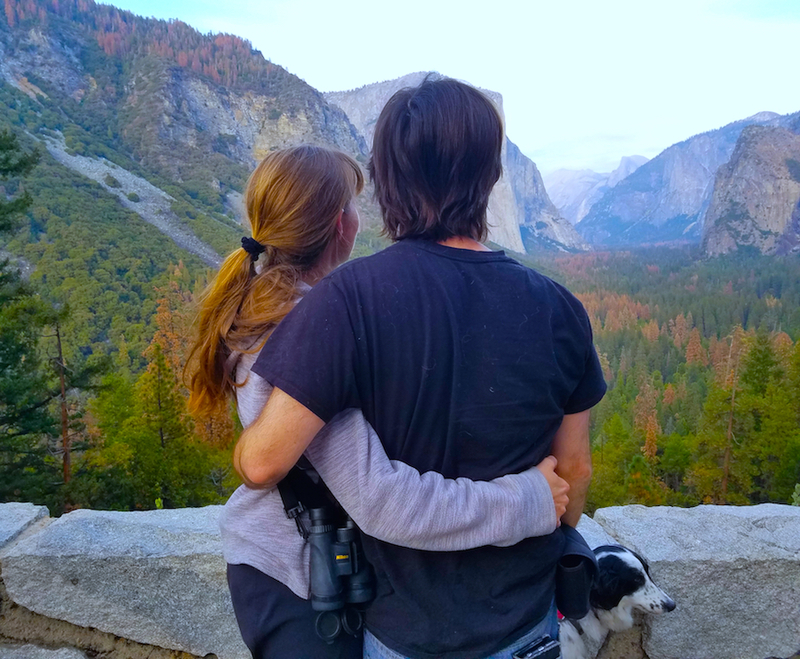 If one of your birds dies and you want to know what happened (and whether it might be contagious), they have instructions on their website for delivering/shipping the bird to them and all of the testing options. If you want to have your post-necropsy bird back, for $10-$15 more you can even have a cosmetic necropsy done (you can also take it as is for no extra charge). They are a remarkable resource that I have used and highly recommend. I had a hen die from Fatty Liver Hemorrhagic Syndrome (diagnosed by WSU Avian Health Lab) which is caused from feeding high energy foods such as corn. Not wanting to go through that again, I went on the hunt for a local, organic, non-gmo, corn-free food and found Scratch & Peck. They’re local (Bellingham), strive to be sustainable (even their bags are from Vancouver, WA and compostable) and they carry a soy and corn-free feed. And my flock loves it! Because their feed is milled locally, it’s incredibly fresh. In fact, I got an order of feed on May 30th that was milled on May 23rd! I’ll bet most feed companies can’t claim a week turnaround from mill to beak. They have a lot of other feed options (including goats and pigs), so check out their website, give them a call (they’re really nice) or send them an email and find out if they’ve got a feed that will work for you. A note on veterinary care… Everyone raises chickens for different reasons and everyone has a level of care to which they’ll go if one of their birds is injured or sick. In my case, my flock provides eggs and manure, and they’re also my pets. It was a struggle in the South Puget Sound region (near Tacoma, WA) to find someone who was even willing to see a chicken. Most of the emergency vets would do it (I didn’t find any regular vets with chicken experience) but with the caveat that they would be calling other animal hospitals in more rural areas for assistance or that they would “do their best”. And, in an emergency situation, that’s what they did and I was very appreciative for their efforts. Over time I was able to find a few reasonably chicken-knowledgeable places – ACCES (Animal Critical Care and Emergency Services) in Renton is one of them. They have great doctors and staff, and their facility is first-rate. It is a 24-hour hospital which is nice because chickens never get sick at noon on a Tuesday. As luck would have it, I was talking with Dr. Crespo at the WSU Avian Health Lab (see above) about one of my hens and she mentioned there was a veterinarian who specialized in chickens in Bellevue. 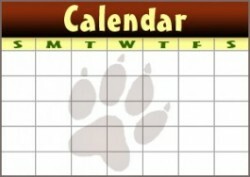 Dr. Bruce Singbeil is the owner and head veterinarian at Crossroads Vet. His bio on the website is impressive and it doesn’t even mention his decades of experience with chickens, both here in the United States and abroad. If you’ve got a chicken and your chicken has a problem, Dr. Bruce is THE veterinarian to call. I won’t go on for too much longer about how wonderful of a chicken vet he is but it’s important to share that he does the exam in the room with you so you can learn how to handle and examine your own birds (if you wish) and do some other procedures yourself. And he takes the time to answer questions well and in a way that you can understand. I trust him with my birds and completely credit him with saving my Ameraucana, June’s, life. If nothing else, it’s wise to have a few good veterinarian numbers programmed into your phone just in case. RIR, Sprite, enjoying healthy organic fruits and veggies from our kitchen scraps. You can chop by hand or run them through a food processor. Deep chunk of sod from unkempt corner of yard – throw it in for tons of scratching fun (and kick it over daily for access to larvae/worms) – my hens give this one two talons up! And with that, I’ll end this lengthy post. 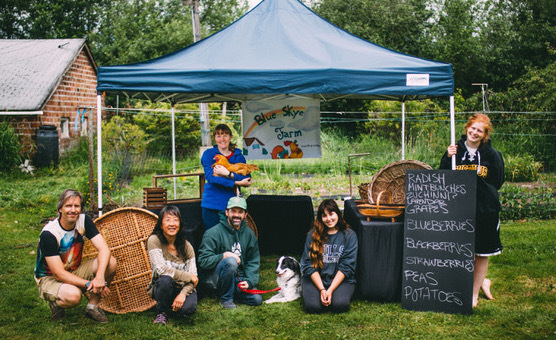 Many thanks, once again, to those who visited us at the Whatcom Skillshare Faire. It was an inspiration to see so many people seeking out and teaching ways to become more sustainable and endeavoring to protect our Mother Earth. Thank you for your excellent presentation at the Mother Earth News Fair in Puyallup. I especially appreciated such practical ideas like the chicken salad bar and raising mealworms. Thanks, also, for the helpful links in the above article. Thanks Kim for the great information. I love the idea of growing the mealworms. and also the salad bar box. Soybeans are an industrial product, not fit for man nor beast. Soldier fly larvae are a great option for a protein source. Or duckweed.